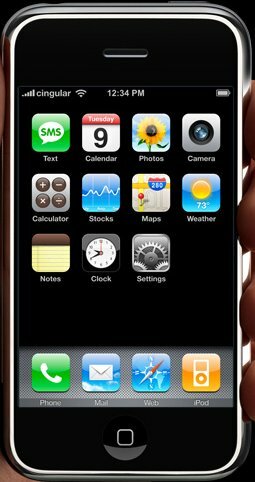 Apple calls this a combination mobile phone, widescreen iPod with touch controls, and an Internet communications device. It’s a testament to great design, especially if you see any of the demo videos on Apple’s site. It runs a version of Mac OS X and uses gestures to navigate the interface. For example, to zoom into a Google map, you squeeze your fingers together like you’re pinching something. It’s even got Dashboard widgets. Very cool. This is my and lots of other people’s dream phone, but there are a couple of problems. First is the price – $499 for the cheaper of the two models. That’s expensive for a phone, but not too bad for a smartphone. The second problem is a killer though. The iPhone is Cingular only, and will be for two years. Cingular has practically no presence in North Dakota. I’m guessing their closest store is somewhere in the Twin Cities. We’re pretty much stuck with Verizon, Sprint, and Alltel. Verizon gives us the best coverage, but I’d put them as the last carrier waiting in line for the iPhone. They’re all about lock-in and nickel and diming customers by forcing them to pay for ringtones, wallpaper, songs, etc. instead of just syncing with a computer. I hate that they do it, but I don’t feel like we’ve got a better option for mobile phones in Grand Forks. I caught the CNBC interview with Steve Jobs. I’m not even really into smart phones or a lot of things that get labeled “new technology” or whatever. But I miss working and playing on a Mac, I cried when I couldn’t find my iPod. It’s good to know that there’s a company that designs for effectiveness, not just efficiency, or aesthetics, or whatever a company like Microsoft does. The Cingular thing definitely is a bit of a bummer. At first glance it seems like a mistake. But so does an options scandal and that hasn’t hurt too much at all. Yeah, the options scandal is a little scary for Apple. The company is so dependent on Steve Jobs for its success. If he were to leave because of the scandal or his pancreatic cancer were to return, it could cause some big problems. He’s their greatest strength and their greatest weakness. I’ve seen the demonstrations on the Internet about how you can find another person using a Zune and give them a song they can play three times. It takes forever. By the time you’ve gone through all that, the girl’s got up and left! You’re much better off to take one of your earbuds out and put it in her ear. Then you’re connected with about two feet of headphone cable. That’s awesome, I’m glad he’s not making “sugar-water” anymore.